ShadowBet Casino - Ouroboros - Free Rewards! Discussion in 'Bonus Spins - Extra Spins - No Deposit Bonuses' started by Marina, Jun 26, 2017. Play Ouroboros at Shadowbet Casino and Win Extra Free Spins! these games are always a hit with players. Now players have the chance to win free spins on a new ancient-civilization themed game at ShadowBet Casino. Ouroboros is a game that picks up on the ancient Egyptian genre, named for the ancient symbol depicting a serpent or dragon eating its own tail. ShadowBet Casino offers you the chance to spin the reels of Ouroboros slot for free with no deposit or registration required! so that everyone can play, try their luck on the reels and attempt to double their winnings – without the need to register at the site! 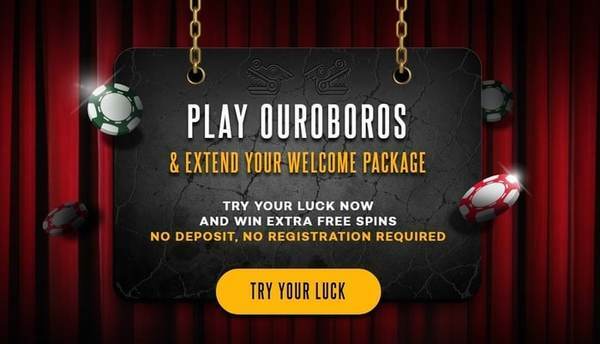 ShadowBet Casino announced its new rewarding system, so that with every few wagers you place on casino games at the site, you will be able to activate Ouroboros slot. ShadowBet stated that what is exceptional about this slot game is that it gives players the opportunity to double almost every reward they receive. This is just a shout-out to fans of Aloha! Cluster Pays Roulette game. Play at the Party table at ShadowBet Casino every Monday to Wednesday in June, and you could win € 2,500 in cash. There is still one chance to enter this promotion in June! Play Aloha! Party table every Monday to Wednesday from 14:00 to 2:00 (CET). Every time you play the 10 rounds of roulette, you earn a draw ticket. The more tickets you earn, the bigger your chances of winning a prize. You can earn up to 50 draw tickets each day! The cash draw will take place on Thursday, June 29th 2017, and on Friday the 30th 2017, you will find out if you enjoy a share of € 2,500 in cash. Bet You Can’t Lose on Tuesday: Every Tuesday, the casino offers a ‘no risk on the first bet’ offer to players. The offer applies to blackjack and roulette on alternating weeks, so that one week it applies to blackjack, and the next on roulette. If you begin a game and win, that’s great for you. If you lose, ShadowBet will return the money to you the next day. Wednesday Happy Hours: Everyone gets 10 free spins in the Happy Hour Wednesday offer at ShadowBet Casino. Log in to your account to earn 10 free spins on Starburst, Attraction, Lights and Pyramid: Quest for Immortality slots.